During the Revolutionary War, wounds and fatalities mostly occurred from bayonets, gunshots and swords. But scalping by American Indians was also widespread. The scalp, along with the hair (and sometimes even a person’s ears), was a trophy prized above all others. In most cases, a scalping victim was already dead or soon to be, though there are accounts of people being fully conscious during the grisly act. However, even though scalping was intended on being macabre and lethal, some scalping victims actually survived. Many of those who survived later died of infections, including instances where the bare bone of their skull would become necrotic, exposing the brain. 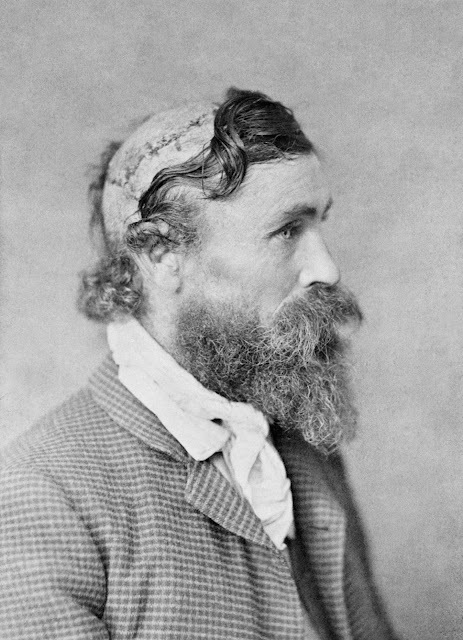 One of the most famous survivors was Robert McGee, who was scalped when he was only 13-years-old. He knew exactly what it was like to have the flesh ripped from his skull. In 1864, McGee was travelling on the Santa Fe Trail towards New Mexico when his wagon train was attacked by a tribe of Brule Sioux Indians. Led by their chief, Little Turtle, they slaughtered everyone on board, including women and children. McGee had to watch in horror as their blood was shed. When he was brought before Little Turtle, the chief settled on killing the boy himself. First, he fired a bullet into McGee’s back and shot two arrows through his body, restraining him to the ground. Then, he pulled out his knife and cut off sixty four square inches of scalp and hair from McGee’s head. It is said that Sioux warriors took much larger pieces of scalp from the head than other tribes. He was awake the entire time. Robert McGee, head-and-shoulders portrait, facing right, showing effects of being scalped as a child, circa 1890. Following the ambush, he was left to die, but soldiers soon arrived and discovered his body. He and another boy miraculously survived. Although the other boy died after being rushed to Fort Larned, McGee went on to make a full recovery. On average, it took scalping survivors about two years to recover. The photograph featured above was taken in 1890, when he finally revealed his harrowing story to a local newspaper.